The Piece Keepers Quilting Group meets every Monday at noon in the Parish Hall. The Quilting Group works together on projects chosen by the group. 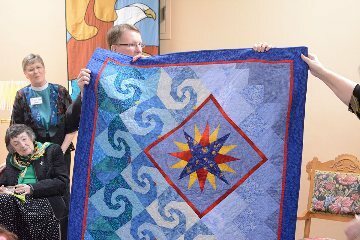 The quilt shown above was a retirement gift for Father John Allen. We finished a quilt for St. Andrew's house. We have also made quilts for many of our elder parishioners. The Piece Keepers Quilting Group is open to anyone, with or without quilting experience.